The University of Arizona was the first university in the state of Arizona, founded in 1885, and is considered the flagship of Arizona’s three public universities. To remain competitive, the team of TMP/Breckenridge Group Architects and Counsilman-Hunsaker was retained by the university to design a new outdoor aquatic venue known as the Hillenbrand Aquatic Center. 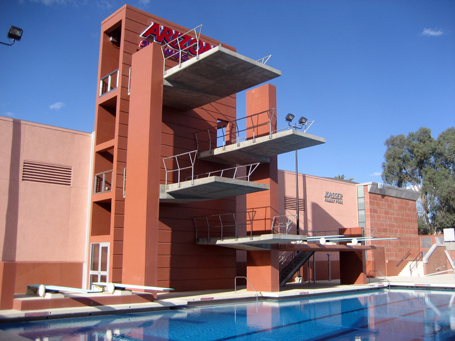 Design included demolition of the existing diving well and towers to make way for a new Kasser Dive Pool, which includes an 8,900 sq. ft., 25-meter by 33-meter pool, a 10-meter diving tower with platforms and springboard diving, and a 130 sq. ft. 10 person whirlpool spa. Also featured is a sparger system for divers in training, which provides a soft-landing cushion of aerated water by introducing diffused air into the water below the diving components. In June 2018, Counsilman-Hunsaker conducted an audit of the Kasser Pool to identify conditions that were substandard; identified items not to current industry swimming pool design standards or codes; identified equipment that is not functional or not operating as designed; and assisted in defining a course of action regarding any necessary updates, repairs, or modifications to the pool or pool systems. In addition, an opinion of probable construction cost was provided for recommended repairs and/or updates that would serve to improve the operation of the pool and bring the pools up to current industry swimming pool design standards.